Do you get discouraged when you think about website maintenance, Search Engine Optimization (SEO) and Google Indexing? You are not alone! As a photographer I often find all of these things to be extremely overwhelming. I just want to make photographs in all honesty... To make things a little bit easier on you so you can get out shooting more, I have created this special SmugMug Website SEO Guide just for you! 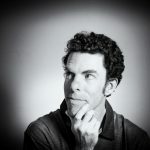 Buy the SmugMug SEO guide complete with 16 pages of tips to optimize your SmugMug website and get it indexed on google. Tons of tips and SmugMug SEO Info on sale for just $4.99! My job as a website developer has lead me to discover that template websites such as the ones created by SmugMug aren't the easiest to optimize for SEO. SmugMug has come a long way and they have done an amazing job to create smart and beautiful looking website templates for photographers. These websites deserve to be optimized and indexed by google as much as possible! If you are new to SmugMug, it is extremely easy to setup a website and start optimizing it for the best possible results on google. 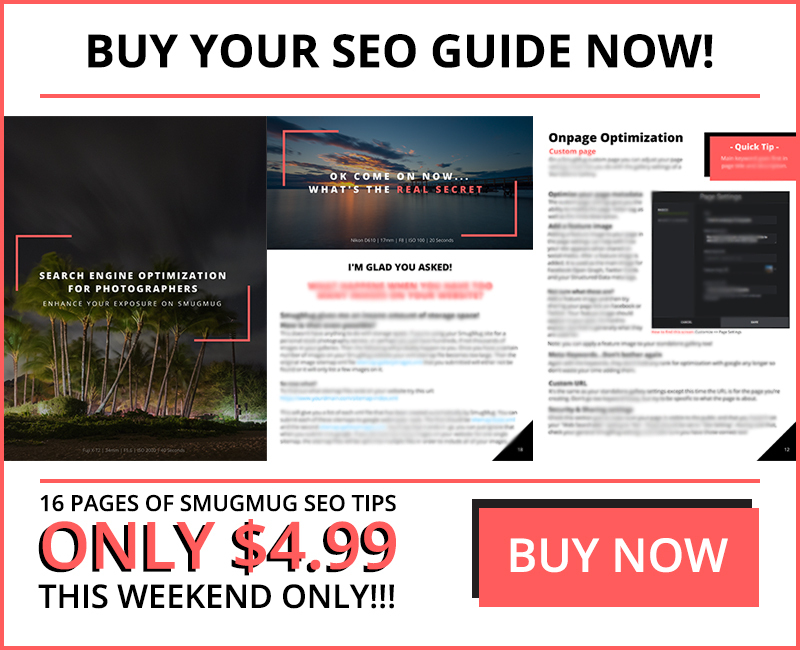 Buy Your SmugMug SEO Guide Now! Your image metadata is an important factor for optimization with google search. Learn what your image needs before you upload it to SmugMug. The SmugMug platform has a powerful image optimization tool. In this guide you will find some tips on optimizing your image for google search. Your website page title and description are very important parts of the optimization process. Learn a few best practices inside the SmugMug SEO guide! SmugMug contains both galleries and custom pages that need to be optimized. This guide will show you the best ways to optimize them. Onpage optimization is a standard SEO practice, but on SmugMug it becomes more difficult. This guide will help you to optimize your custom pages. Getting your site indexed once it is complete is a must. Learn how to submit your website to google. You may not even know what webmaster tools is, but it's a very important part of the optimization process and will give you some valuable information about your customers. Read the SmugMug SEO Guide to learn more about it! Pinpoint the best keywords to optimize your website with Search Analytics in Webmaster Tools. This guide will show you how! SmugMug sitemaps explained! Don't miss out on this valuable information about XML sitemaps. Yes, there's image sitemaps too. Learn the secret to getting your images indexed on google search. Sharing links strategically will take your website optimization to the next level. Get a few pointers on backlinking in the SmugMug SEO Guide! Get your business listed now! You're missing out on valuable customer data. Thanks! This article was very helpful in my quest to understanding more about optimizing my site. I run tests and the SEO test states I have no XML but smugmug keeps telling me I don’t need one. hope you still keeping up, Had a friend say it may be an XML issues, but I don’t know how or what to do in the webmaster. How I run my website in the google account, two domains added, each page url is added and crawled, google then states being blocked by robot text. Very pleased with the outcome of so much work and always learning as I go, I find photography simple compared to websites. Use of Photo without Permission – What now?